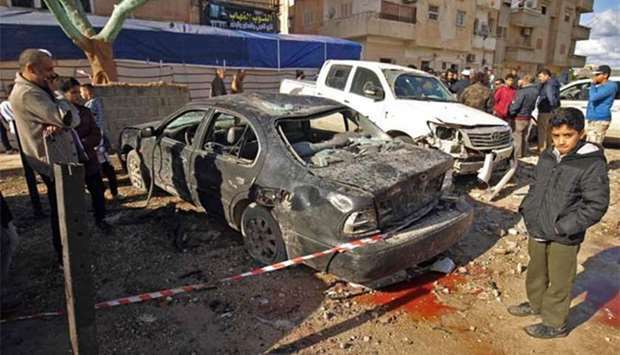 Libyans check the aftermath of an explosion in the eastern city of Benghazi on Wednesday. Twin car bombs outside a mosque frequented by jihadist opponents in Libya's second city Benghazi killed at least 34 people and wounded 87, hospital sources said on Wednesday. The eastern city has been relatively calm since military strongman Khalifa Haftar announced its "liberation" from jihadists in July last year after a three-year campaign, but sporadic violence has continued. The bombers struck after evening prayers on Tuesday, blowing up two cars 30 minutes apart outside the mosque in the central neighbourhood of Al-Sleimani. There was no immediate claim of responsibility but the mosque is known to be a base for Salafist groups which fought the jihadists alongside Haftar's forces. The city's Al-Jala hospital received 25 dead and 51 wounded, its spokeswoman Fadia al-Barghathi said. 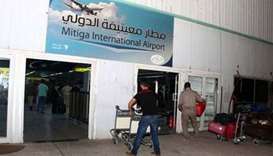 The Benghazi Medical Centre received nine dead and 36 wounded, spokesman Khalil Gider said. Ahmad al-Fituri, a security official for Haftar's forces, was among those killed, military spokesman Miloud al-Zwei said. Libya has been gripped by chaos since a Nato-backed uprising toppled and killed longtime dictator Muammar Gaddafi in 2011, with two rival administrations and multiple militias vying for control of the oil-rich country. Haftar supports an administration based in the east of the country. A UN-backed unity government based in the capital Tripoli has struggled to assert its authority outside the west. UN efforts to reconcile the rival administrations have so far produced no concrete result.